Learn how to develop a long-term social media strategy for your sales team in this post from LinkedIn Sales. Peanut Butter & Jelly. Chips & Salsa. Cake & Ice Cream. So many things in life are better when paired with a complimentary item. Who doesn’t crave ice cream at the thought of cake? Or salsa at the sight of freshly toasted tortilla chips? Culinary masterpieces don’t often happen overnight though. 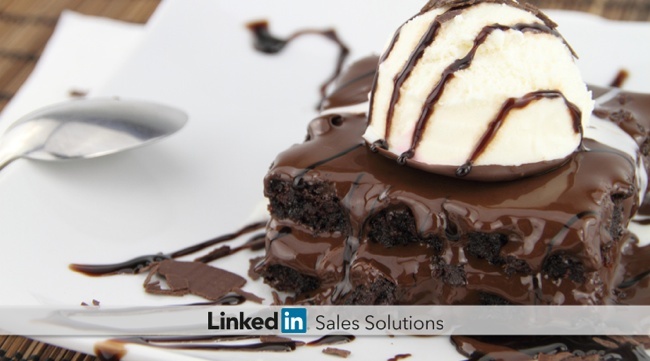 Pairing sales and social media is a long-term strategy, but the end result can deliver mouth-watering leads. If your teams can use help, circle up around the kitchen table and consider these next steps for creating tasty leads in the New Year. When everyone is on the same page, efforts can be integrated to work toward a common goal, such as agreeing on what a qualified lead looks like. Sales pros are constantly searching. They’re hungry for new prospects, searching for new opportunities and longing for insight to create engaging conversations with these prospects. Social media is a colossal clue buffet. Even if you’re not actively participating in social conversations, you can still follow the digital footprints of your prospects, customers and competitors. What are the most pressing questions for buyers in your industry? How do these questions vary for prospects starting the buying process vs. those in later stages? How are they framing the question? What language are they using? Which group discussion topics generate the most discussion? What types of social messages generate the most engagement for your company? What are the most popular industry hashtags and what topics are being associated with these hashtags? How is the competition using social media to generate leads? What can you learn from this? What other areas of the website does traffic generated from social media find interesting? Make it a point to schedule monitoring time for 2 – 3 social channels each week. You’ll be amazed by the lead generation insights, ideas and engagement opportunities you uncover. At the very least, this information will help you ask better questions, use content more effectively and talk in the terms your prospects can understand. Social media has changed the entire menu, offering a plethora of new opportunities for marketing and sales to work together in the pursuit of lead generation. These efforts combined allow your sales team to increase interactions with prospects and customers, enhancing the value of those relationships. Social media when united with lead nurturing are proving to be a winning combo for sales professionals and increasing your company’s bottom line.